The guides were handed out to members of the public at Continental’s Vision Zero live customer safety event at Donnington Park this week. 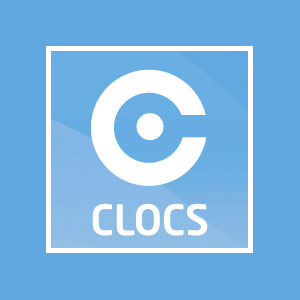 They show road users the key challenges van and truck drivers face on a daily basis, offering safety advice to those who may not usually drive a van. The guides come after a Continental survey found a lack of understanding between UK motorists, and a desire for better education between different types of road users to improve driver tolerance and reduce accidents. Approximately 3,500 road users took part in the survey, representing cyclists, pedestrians, passenger car drivers and professional drivers, including van, taxi, bus and HGV. Alongside high levels of mistrust of other types of road user, 60% of each group of drivers agreed that better education could be the answer to better sharing the road and would help make drivers more considerate. In addition, 78% of commercial vehicle drivers questioned said they believed non-commercial driver training should include information on how to drive with more care for fellow road users. The easy-to-understand graphics seek to support the need for better education and highlight to other road users how light and heavy commercial vehicles use the road, to help increase safety. The campaign is part of Continental’s Vision Zero initiative, which seeks to eradicate fatalities on the road networks. This week members of the public and Continental Commercial Vehicle dealers attending its Vision Zero Live event at Donnington Park were given the opportunity to learn how to be safe around not only cars, but LCVs and vans, in a series of hands-on training modules designed to increase understanding of other road users to improve safety. Mat Wilkinson, Commercial Director at Continental, said: “The results of our survey found that roughly one third of UK car drivers believe van drivers to be the least considerate motorists. Yet we understand the challenges van drivers face daily while working on increasingly busy roads and, for many non-fleet drivers, this is done without any additional training. One of the most notable findings was the confusion over the correct stopping distances and this is clarified in the guides. 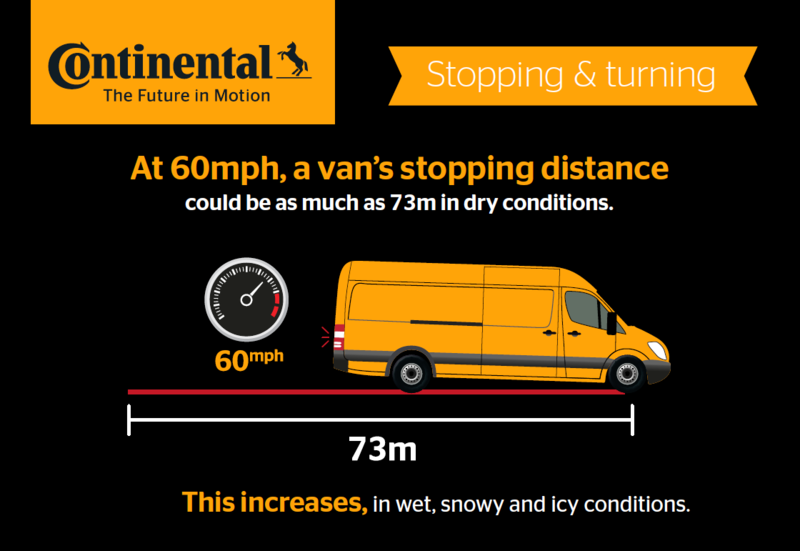 The advice also addresses elements of van driving which may not be immediately obvious, such as difficult weather conditions and driving with a lack of visibility. According to the Highway Code, stopping distances range from three to twenty-four car lengths, depending on speed. The weight of a van or truck’s cargo, as well as its size, will affect its stopping distance. Van drivers should always be wary of what they are carrying, and those around them should take caution and leave plenty of space. 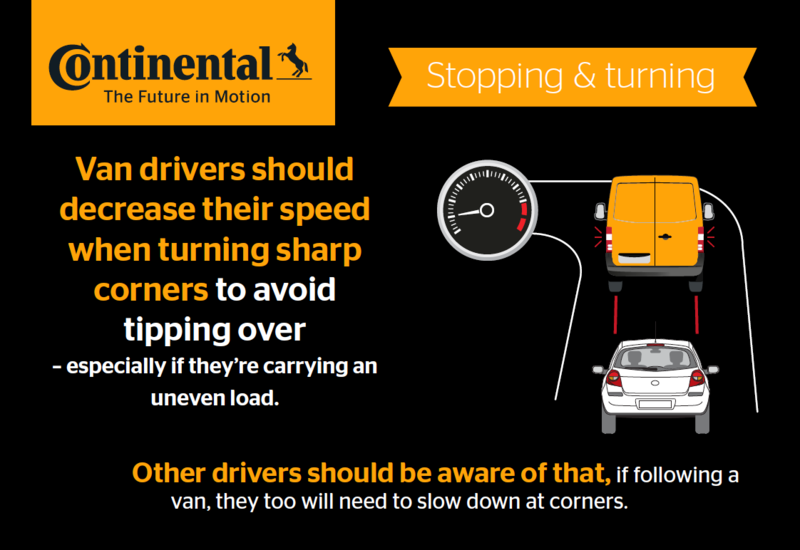 Van drivers should decrease their speed when turning sharp corners to avoid tipping over – especially if they are carrying an uneven load. If following a van, other drivers should be aware that they too will need to slow down. 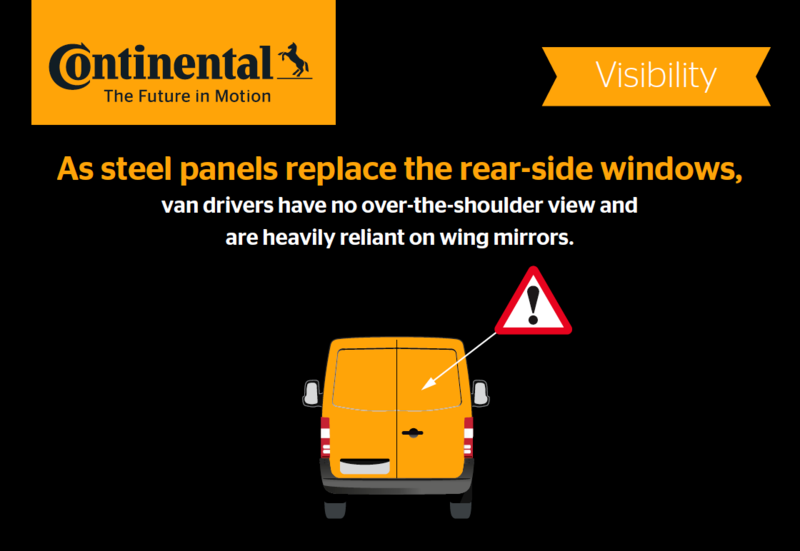 As steel panels replace the rear-side windows in a van, drivers have no over-the-shoulder view and are heavily reliant on wing mirrors. Tailgating a truck or van is especially dangerous, as cars and other small vehicles may be partially or entirely obscured. Instead, drivers should stay where they can be seen in their wing mirrors.